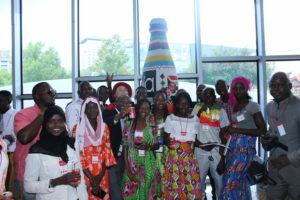 Nearly 100 students from 23 African countries arrived in Atlanta, Georgia, this summer to participate in the Pan-Africa Youth Leadership Program (PAYLP). Many students were not only traveling outside their respective countries for the first time, but also meeting citizens of neighboring countries for the first time. Participants shared that they were equally intrigued by exposure to the customs and personalities of fellow Africans, along with those of the Texans, Washingtonians, Hoosiers, and other Americans they met during their three-week cultural and educational exchanges across the United States. Upon arrival in Atlanta, students were challenged to assess the greatest needs of their home communities and use their time in PAYLP to build relevant solutions. Three weeks after first being put up to that challenge, students landed at their final destination of Washington, DC. In a culminating event, on the penultimate day of the trip, students delivered their responses in the form of Community Action Plans. Moments before the presentations, students paced the halls of Meridian House – one of the two historic homes that make Meridian International Center’s educational campus – practicing lines, visualizing transitions, making lastminute edits, or nervously congregating in the bathroom for pep talks with friends. Judges from the local DC social entrepreneurship ecosystem sat side-by-side at a table, slid on translation headsets, and took in the image of a room full of highly focused and brightly dressed teenagers awaiting the presentation of their lives. Developmental levers, such as this moment, are invaluable to the individual participant and the community to which he or she belongs. Over the past decade, many countries have undergone quick transitions from confident and stable economies, or “emerging markets,” to slowed, stagnant, and scrambling to create jobs for its citizens. The world is turning an irrevocable page into a global knowledge economy— where investment in human capital is unprecedentedly vital to the stability of a state. Leaders must invest in early identification and development of their native talent, and do so inclusively of underrepresented demographics. Over the past decade, as government and private sector alike emphasize new job creation, cities have been doubling, even quadrupling, their start-up ecosystems — venture capitalist funding, incubators, accelerators, and conferences, among many generating forces. This is an important evolution; however, cities are still struggling to find the talent prepared to make use of these initiatives. Conclusively, the “pre-pre” developmental interventions for workforce and entrepreneurship, like the cannot be overlooked. The need for earlier talent interventions was a prominent focal point of PAYLP’s Community Action Plans. Students presented new school models and inclusive recruitment pipelines for job training programs, to name a few. This need is also local and shows up in the news and data in DC’s own backyard. 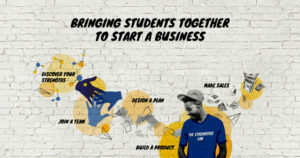 My work with The Strengths Lab, a 501c3, leverages Gallup research and science to provide strengths and challenge-based experiences that meet students at this stage of development. Aiming to bridge that gap are cross-sector initiatives, such as Capital Builders Center, working with Strengths Lab and Gallup to identify students in low-income areas of Washington, DC, and direct them into strengths-based talent development at the University of District of Columbia. Capital Builders Center scholarships enable students to earn college credit for building businesses. Another collaborative effort where Strengths Lab focuses on bridging talent preparedness to opportunity is the Sustainable Communities project, led by energy conservation group, Thinkbox. Multidisciplinary stakeholders across DC are taking on the complex challenge of building sustainable communities by investing in residents in addition to infrastructure within the DC Housing Authority. Strengthening a city by investing in its human capital requires an inordinate amount of cross-sector collaboration. As the drivers of success in countries and regions become increasingly interdependent, Meridian is well-positioned to continue facilitating the collaboration needed for effective continuity in the development of the new talent that many countries are depending on. 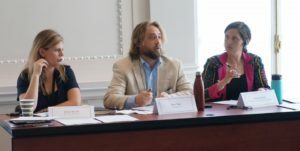 This guest post was contributed by By Emily Massel, Executive Director of The Strengths Lab, who participated as a panelist judge for the Community Action Plan pitch session of the 2018 summer PAYLP cohort. POST TAGS: Africa, PAYLP, Social Entrepreneurship, Youth Leadership.